I visited Brauhaus just after the famous Oktoberfest. I visited Allianz Arena just after the notorious match between Bayern Munchen vs F.C. Koln. I visited Olympiapark just after the illustrious annual Munich Marathon. At the end of October, I went to the capital of Bavaria, Munich. Yes I missed all of the above! And yet, Munich is one hell of a place for architecture. Beer no more, just brother bear. Crowd no more, just glitzy pillow facade. Run no more, just chill and ride. Back in the day the city started as a modest medieval town where it was developed as the center of gothic arts and politics. As Munich got more attention, in the early 1800s, it became the capital of the Kingdom of Bavaria. During that era, a lot of buildings built at that era were of the finest gothic revival architecture pieces in history. As typical western European city, Munich has the old city as the center and further development branches out from the outer ring road and meanders around relatively flat topography. Isar river, major stream that goes over Bavaria and Austria sits just right by the old-used to be fortified-city almost splits the city into west and east. Vast greenbelt stretches almost along the river from the very north part of the city to the south. The Englischer Garten which is located close to city center and to the north is even bigger than New York's Central Park. Having spent this year's summer in New York, I would imagine how massive the garden is, as I have never get to explore Central Park beyond 88th street. Apart from deeply rooted into rich history of arts and architecture, the city is known for the center of advance technology and home for large companies that drives the major economy of Germany. Some of them have also brought opportunities to push further the field of architecture. I was super excited to visit BMW Welt since last semester I happened to choose this building as a case study for a construction class. The class's final submission is a model to express understanding of structure and tectonics. Yes, after that exercise, I know how difficult it is to realize such a building. New BMW owners can take their new ride to roll down the spiral. There is this skepticism build up in my mind upon bad execution of any attempt to fabricate complex geometry. However, the build quality of BMW Welt is mind-blowing. Coop Himmelb(l)au has done a terrific job on coming up with elegant solution for panelization on complex geometry. There are several different kind of panels as you might notice. The double cone is the most complex as it involves many different kind of panels, triangulated glass panels and perforated aluminum panels that continues to the ceiling and transform in rhomboid geometry. Suspended walkway that runs through the building and out connecting the Welt to the museum. In the interior subtle fold appears in the rhomboid-shaped ceiling module as it meanders through the roof geometry. Variation happens also to accommodate lighting fixtures, vents, and structures. The suspended walkway is clad with more rectangular panels with double curvature when necessary. As double curvature panel is harder to build, the panel gap is slightly bigger in order to tolerate fabrication inaccuracy. Test driving on the spot. All in all, this is a very sophisticated building, truly a reflection of what BMW as a leading car manufacturer brand. Tortured double cone as the foreground of the bowl-shaped museum. 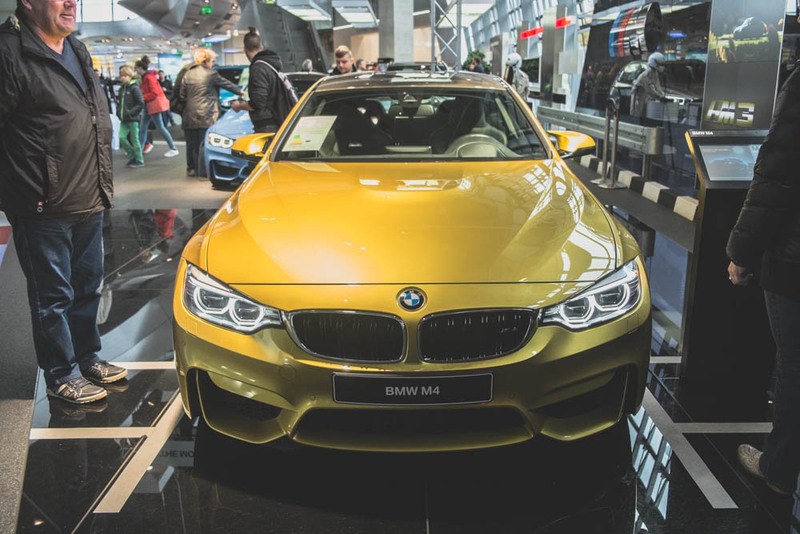 BMW Museum, as predicted, consists the history and the evolution of the company. The building was established in 1973, a year after the Munich 1972 Olympic. The architect, Karl Schwanzer, which also designed the adjacent headquarter tower came up with silver salad bowl 40 meters in diameter. Even today, the iconic silver bowl still looks like it comes from the outter space. BMW-acquired Mini brand is having exhibition in the BMW Museum. Model tags of all BMW cars. A couple weeks prior to my visit here, I happened to watch the documentary about Frei Otto, this year's Pritzker winner at the Architecture Film Festival in Rotterdam. Having known his process and back story from the movie, I couldn't wait to check the actual building in person. And my gosh, it is beyond belief. Aquatic center, single sided seating overlooking the pool and garden as the background. Nature found shape sets in the landscape. Frei's form finding experiment through the minimal surface tension of soap bubble. Massive masts, steel cables, and glass panels to create a unified system of tensile structure. I am so impressed by the amount of engineering that comes into the realization of this structure. At 1972 when its finished, Germany has proven to the world that they have the capability to engineer such structural system which was way years ahead of its time. Even still super impressive for today's standard. Munich is such an astonishing city in both its historical relevance and also its technological advancement. It is interesting to unravel the city through the contrast between those projects. Next up, art museums and urban lifestyle in Part 2.